I'll be taking part in my first big gallery show on the 27th of March and would love to see some friendly faces there! I'll be showcasing some one off large prints of the work I've been doing lately as well as some brand new pieces for the show! I need to sell at least 20 tickets as my contribution so if you are keen to come please follow the link, click "buy a ticket for this artist" and as a BIG thank you I'll have something special for you on the night! This has been a very long time coming, so lets get to it. A few months ago I had the amazing opportunity to visit Kellyville public school. As a room to read ambassador, and children’s book illustrator I’ve been fortunate to have been in the school circuit for a while and visited so many amazing kids but never have I been to a more welcoming school then Kellyville. Not only had they been preparing for my visit for a week, looking through my website and discussing my work but they had also prepared questions to ask me. It was so amazingly refreshing to be surrounded by passionate inquisitive kids that actually had a sense of what I’ve done. On top of that some of the kids had even gone as far as to write stories based on one of my illustrations which absolutely made my year - it was such a great feeling to see I had inspired kids to get creative! I’ve included some of the stories bellow by these incredibly gifted kids - Thank you again Kellyville - it was an absolute pleasure! Today we visit the Sparkling Sands Beach to show our gratitude for our tragic loss. 1 year since the horrifying moment domestic violence really took a toll on our family, 1 year since the horrifying moment dad lured mum into the garage. 1 year since that horrifying moment Diego and I heard mother’s screams. 1 year since mum’s passing. With a bouquet of roses in my left hand and a portrait of my mum in my right, I approach the shore where mum’s ashes were left. Diego is right beside me holding another bouquet of roses and a family portrait of mum, Diego and myself from when we only young. A small, clear dew falls from Diego’s eye, hug him amorously and we both throw our bouquets into the calm ocean. The tide sweeps the flowers away into the vast sunset. As we say our final farewells, Diego walks towards the car. But I notice a bright, shining substance drifting to shore. A message in a bottle. Diego sprints to my side as I opened the bottle. “Please, don’t go now, you just got back!” “I apologise sweetie, I haven’t got a choice” father exclaimed whilst fumbling with his dry fingertips. The smell of sea salt and fish filled the living room in our crowded house, a week ago father arrived from his 1 month fishing trip. He was a deckhand aboard The Nightingale, a gigantic fishing boat that is in charge of getting the main supplies of fish, crab and other seafood for our islands markets. “Father it is not fair on you and us, your Captain told us you would be here for the next three months, and now, starting tomorrow, you will be at sea instead!” I replied angrily. “You talk about the scenario as if it is some sort of a Childs game but believe it or not this is how I get food on the table for you and your mother!” My eyes started to water and I tried to hold in the fact that I was miserable and just wanted him to stay. I slowly nodded as a sign of respect and looked him in the eyes to see if I could tell what he was thinking, but all I could see was his forgiveness and sympathy. I turned on my heels to the rickety old stairs behind me and walked carefully up to my room and tried as hard as I could to forget what I had just left behind… That night the house was silent, even a pin dropping would be heard, whilst my parents were asleep I sat by a dim candle and wrote a message for my father which I would give to him at the docks tomorrow when he took off for his departure. Knowing I would at least see him tomorrow helped me rest peacefully. The next morning I put on my best Sunday dress that I normally wore at church. It was bright yellow and tightened at the waist, I slipped my note into an empty glass bottle with a cork so father could keep it with him everywhere. I popped the bottle in my right palm and felt the smooth, cold glass press against my warm skin. I took one last look at the silky pages that were the colour of crisp white, and my tattooed words in a brilliant black ink imprinted on the pages. I shut my eyes and opened them once more realising I was ready to face today, ever so cautiously did I make my way downstairs and out the front door to the dock. Yet when I got there only mother was left, she stood there in her hunch like posture and sobbed quietly into a wet tissue that is when I saw it, my Fathers boat sailing away with my hope. I called to him to get his attention but he thought I was just waving so he waved back. I eventually lost him in the upcoming mist, my mother eventually left and I followed her up the stairs that lined the hills of the island and then simply rooted my feet on the ground as my mother walked away. I stood there until evening as the sun settled, that is when I felt the need to throw the bottle into the ocean in an act of strength, in an act of hope, an act of lost hope. I left and wondered if it would really ever get to father. P.S. thank you for the letter my darling! Issue 3 of Punky is online! In other news I'll be at Melbourne Supanova next weekend from the 11th to the 13th at booth A083 in the Indie Press zone. I'll have a limited edition posters of all the Old Superheroes from last month! So come say hi! Hey everyone. Hope you've been fairing well since the last update. If you've been a little down I'm hoping this cheers you right up! In this issue Punky gets a tour of a magical place full of beautiful costumes and exotic artifacts -- Henry's camera studio! Henry sure seems like a grumpy old guy, but that can't keep Punky's spirit -- or Brandon's tail -- down! But how could an old photographer like Henry take care of a little girl like Punky? It just doesn't seem possible... What're Punky and Brandon going to do? I've had a few people ask what Supergraph's debut was like. Now that I've been back for a week and the experience has more or less settled into my brain I can confirm the experience as pretty darn awesome! Admittedly being there, running on little sleep and going it alone was a bit of a challenge but I met some amazingly nice people (big shout out to Joining forces who even gave me some sleeves when I ran out) who not only provided support and smiles but minded the store when I needed to take a bathroom break. Also want to give big props to the organizes - The show was very smoothly run, with plenty of help provided, and attention to detail was stellar - down to the tables that spelled out supergraph! Crowd numbers were hard to tell as everything was very spread out (they went of the gallery look over market style) but I overheard that at one stage on Saturday there were over 300 art lovers cruising the halls which is very nice to hear! All in all I'd say BIG congrats to the people being the show and I can't wait to do it again next year!! If you have any further questions about the show please comment below or send me an email! I'd be happy to share more of my experience with you! Well, the cat is FINALLY out of the bag! 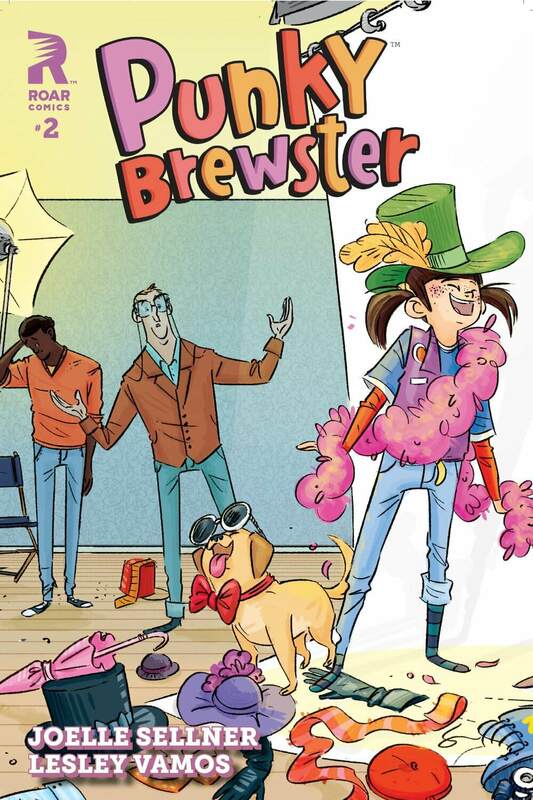 Last year I was approached by Adam at Lion forge to re-invent the 80's classic Punky Brewster. It has been SO much fun getting to re-imagine the characters and breath new life into the adventures of this precocious 8 year old. Please share this around with EVERYONE you can, the success of this would be sweet sweet icing on the cake. I'll try and post some WIP designs from the early development stages so stay tuned and happy reading! So it's the time of year when people are making resolutions to change things for the better… want to do something that costs no money but earns you money and others too? Say NO to spec work - I know it's hard, especially for those just starting out - even I still struggle with it, but if we want to change the industry for the better and help engage a better relationship between us and our clients we need to respect ourselves and the work we do! To help you say no here's a website you can read and send to the next person asking you to work for free! Just bookmarking it is a step in the right direction! Gallery Show was a success! Big thanks to Mike at the Tiki Machine for help co-ordinate such an awesome night - wish I could have been there to see everyone's work up on the walls - Also great to hear that so much was raised for charity! For photos visit the Facebook event!